Your organization expects fast solution development, clear documentation and total security in all applications you build for SharePoint. Satisfying these competing requirements is a real challenge and checking the security and quality of every line of code puts enormous demands on your resources. Nonetheless, failure to do so means problematic code is built into your solution. Why is app security important? The Rencore platform is built by leading SharePoint development experts and is designed to help you overcome these challenges. Our platform provides you with a set of powerful features that give you automatic documentation and analysis of all code in your builds. As solutions evolve, it becomes increasingly challenging to create accurate documentation while also testing the code itself for quality and security. 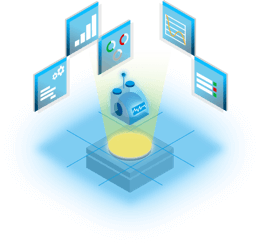 Built by SharePoint experts and MVPs, the Rencore platform analyzes your development projects, assessing all code against Microsoft recommendations and market best practices, while also automatically generating documentation for you. Staying on top of all code and dependencies while following the latest standards for SharePoint development is virtually impossible. The Rencore platform automatically analyzes and assesses all your code to reveal any issues and helps you build solutions that follow Microsoft’s recommendations and market best practices. What risk is your organization exposed to? Find out with our Free Risk Assessment. Dutch company Brabant Water sucessfully integrated Rencore into their SharePoint environment and saw a significant decline in development time, technical support cases, and quality assurance costs. A unique position on the market when it comes to code quality, transformation and platform governance.